ESP Auto Inc., Services: Axles | ESP Auto Inc.
Did you know that the original design for axles came from the mechanism they used to turn chariot wheels in Ancient Greece? Thankfully our technology has refined them so much now that we use super-high quality steel rods to connect the wheels to the car! And your modern axles are critical components because they support the whole weight of the vehicle as well as tying the front and rear wheels to the car. All axles are manufactured to different specifications depending on vehicle size and weight and whether they’re for a front-wheel drive, rear-wheel drive, or all-wheel drive vehicle. In shape, axles are long steel rods that have lug studs at one end. These studs connect with lug nuts which are then mounted to wheels with lug nuts. The other end of the axle connects to the drivetrain and this is how they turn the wheels when you accelerate. 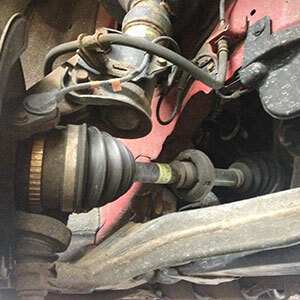 Contact us today if you would like to schedule an appointment for an axle check-up!